Bali has again won the award as the Best Island in Asia in 2014 from international tourism magazine, Travel + Leisure. Commenting on the accolade, Vice Governor of Bali, I Ketut Sudikerta said “We have to develop our destination, while preserving the beauty of Balinese culture,” and that the award is the proof of international trust in the commitment of the Provincial Government of Bali to companies and communities promoting tourism in Bali. In the top 10 positions in the world (Best Island) in the latest Trade & Travel (New York) competition, Bali was in the fifth position with the acquisition of 86.82 points after Santorini Island in Greece, Maui and Kauai in Hawaii and the Big Island, also in Hawaii, United States. The point value was obtained from the travel magazine readers through a questionnaire that was run between 2nd December 2013 and 31st March 2014. The assessment is based on a number of categories of which the natural scenery and beaches, tourist activities, food and restaurants, and the local people are considered. The award was handed to representatives of the Consulate General of the Republic of Indonesia in New York, USA on 24th July 2014. Bali has occupied the first position repeatedly through 2009, 2010, and 2011 second in 2012 and third in 2013. 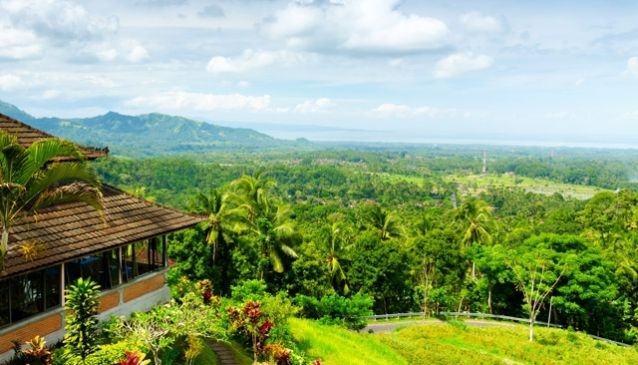 Travel + Leisure also put Bali in the Hall of Fame for being in the top 10 for six consecutive years.